Judging from the jump in General Motors Co. and Ford Motor Co. shares, the market thinks President Donald Trump's accord with Mexico to replace the North American Free Trade Agreement will enable U.S. automakers to carry on business as usual. This could be right, with one big caveat: The companies are going to need Canada to join the deal, too. The preliminary agreement announced Monday allows carmakers to import vehicles duty-free if 75 percent of the content is made in the U.S. and Mexico. That's up from 62.5 percent minimum under Nafta. Under the U.S.-Mexico deal, as much as 45 percent of parts will also have to be made by workers who are paid more than $16 an hour, according to U.S. Trade Representative Robert Lighthizer. To meet the proposed rules, automakers would need to be able to count the Canadian content on some of their current models, Dziczek said. Prior to Monday's announcement, the Trump administration had been threatening tariffs of as much as 25 percent on vehicles imported from any country. 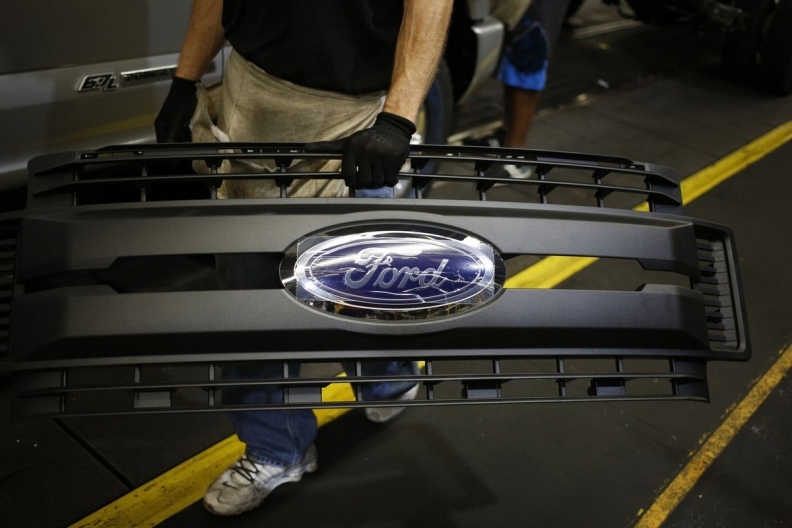 That would hit automakers hard, including GM, Fiat Chrysler and Toyota Motor Corp. The three are the only carmakers that researcher LMC Automotive expects to sell more than 1 million imported vehicles in the U.S. this year. In addition to dodging that bullet, the agreement marks a significant backtrack from some of the initial proposals that the Trump administration floated in NAFTA negotiations, including an 85 percent NAFTA-sourced parts content requirement and a 50 percent U.S.-sourced provision. GM and Fiat Chrysler shares each rose 4.8 percent on Monday in New York trading, while Ford finished up 3.2 percent, the stock's biggest advance since February. On Tuesday, GM shares closed down while Ford shares rose again. If Canada signs on, all but a handful of cars would meet the requirements or come close, Dziczek said. Most of those that wouldn't hit the targets would be imported by European and Asian carmakers, including Volkswagen AG and Nissan Motor Co., she said. BMW said it welcomed a “modernization” of the trade accord, adding that any final decision must ensure duty-free trade between the partners can continue. The new preliminary threshold on content to qualify for tariff-free access was “ambitious,” the carmaker said. BMW produces SUVs and crossovers at its biggest plant in Spartanburg, S.C., and is set to start making sedans at a factory in Mexico next year. The luxury carmaker's shares rose 2.4 percent to 85.15 euros, and was 2 percent higher at 10:23 a.m. in Frankfurt trading. Volkswagen shares gained 2.1 percent and the Stoxx 600 Automobiles & Parts Index rose 1.2 percent. If vehicles don't meet the requirements, they'll be hit with a 2.5 percent tariff, the same levy faced by countries that have most-favored nation status under the World Trade Organization. That's not going to be enough of a tax to get companies to move an assembly plant to the U.S. from Mexico, but it'll raise the price of vehicles, said Michelle Krebs, a senior analyst with AutoTrader. The good news for carmakers is that Canada will likely sign on to a similar agreement, said Mark Wakefield, head of the auto practice at consultant AlixPartners. So long as a Nafta replacement doesn't penalize Canada's agriculture industry, it should be easy to get a deal.